Abol was set off on his vocation of writing by an encounter in 1983 and has since been pursuing a career in writing, performing, recording, translating poetry for events, video and audio recording, and publications in collaboration with literary artistic organisations. So in 2001 Abol was Poet in Resident at the BBC Outlook programme and representing Artists in Exile. He joined the committee of Exiled Writers Ink when Choman Hardi became Chair in 2001 and he was reviewed in Time Out. In 2011 Abol was selected as the Chair of Exiled Writers Ink! Pursuing a strategy conducive to community cohesion through literary events, workshops and projects, e.g. Something Happened in Iran at the Free Word Centre (a narrative on the green movement choreographed through poetry in multi media). Since 2006, Abol has built artistic collaborations with the well known Iranian poet Ali Abdolrezaei and together with Parham Shahrjerdi and other critics or translator/poets have formed London Skool, a literary critical band of multi-lingual poets and critics whose aim is to create poetry and text from hybridisation of languages, genres and lifestyles in order to propose new directions in the literature of exile or post exile literature. Abol has joined the list of 30 poets from Between Two Worlds: Poetry and Translation project at the British Library, being recorded reading their poems with interview for the Sound Archives. 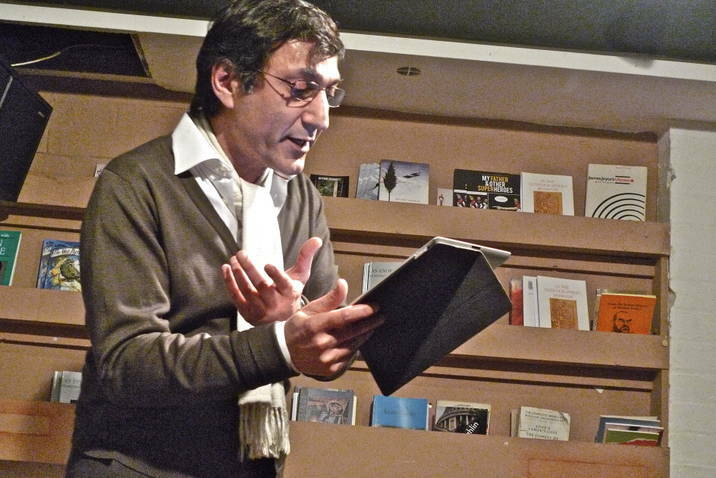 Froushan has over 3 hours of poetry (over 50 poems) and interview recorded for the Sound Archives (Oct 2011, includes 32 of Abol’s translations of Ali Abdolrezaei. Two selections of Abol’s poetry have been published: A Language Against Language (English) 2008 by EWI and the bilingual volume, I need your desert for my sneeze (in Persian & English) in 2009 by PoetryPub. He has also published two volumes of his English translations of Ali Abdolrezaei: In Riskdom where I lived (2008) by EWI and Sixology (April 2010) by PoetryPub. Other published translations of Abol include Parham Shahrjerdi’s Risk of Poetry, by Poetry Pub. Abol has been published in the anthology Silver Throat of the Moon Ed. J Langer and the Exiled Ink magazine, as well as in multimedia web based publications at www.photoinsight.org.uk and www.poetrymag.info (see Bibliography). He has publicly performed his poetry in select London venues such as the Queen Elizabeth Hall, National Portrait Gallery, Poetry Café, New End Theatre, Arcola Theatre, Waterman Centre, Scala Theatre and Riverside Studios. Abol Froushan’s is a poetry of phenomenal presence, a text that records the sudden, and a process of writing that invokes a frequency of imaginings. He inspects archetypes and universals with a microscopic eye, showing detail that one has either not seen or no longer sees, because of habituation of sense, thus exploring what often we don’t know that we know (those unknown knowns). Abol’s poetry is a poetry of re-visioning, re-looking which builds a new atmosphere on each re-visit. Sometimes it seems a few lines of Abol don’t belong to the rest of the poem, but these lines play the role of renegade scores in a symphony that invite the audience to see the poem from other windows. This in fact is the uniqueness or the specialty of Abol’s poetry which gives the reader a freedom to explore/interpret the text from different angles. The last line of the poem Of Peonies is a fine example of this shifting perspective. Abol Froushan has a multicultural approach to language, whether we consider his Persian poems or his English, we can witness this cultural discourse, one can say even between poetry and its language. Sometimes in his poems a mythical theme is knotted with a modern atmosphere and a dialogue occurs between distant times through the language of poetry. Trans. Ali Abdolrezaei (2008) In Riskdom where I Lived. Published by Exiled Writers Ink. J Langer (2006) Silver Throat of the Moon, Published by Green Leaf.